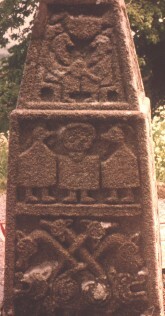 This is a detailed view of the base of the north side of the granite cross at Moone. Carroll, F.M., , ‘Some notes on the Abbey and Cross of Moone and other places in the Valley of the Griese’. In Journal of the County Kildare Archaeological Society (1894) 1, 286-294.